Product prices and availability are accurate as of 2019-04-15 07:38:53 EDT and are subject to change. Any price and availability information displayed on http://www.amazon.com/ at the time of purchase will apply to the purchase of this product. Medline's ERASE CAUTI program is designed to meet the challenges healthcare professionals face with both clinical and educational resources. The program contains three distinct parts including a New Innovative Tray Design that promotes better processes, an Education program, and an Awareness Campaign. 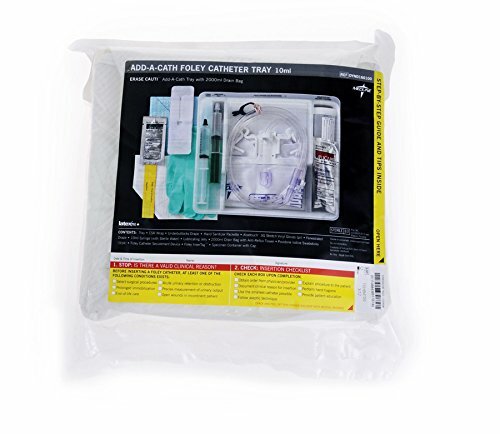 Add-A-Cath ERASE CAUTI Trays feature an innovative 1-layer tray design with components meant to encourage CAUTI prevention: antiseptic hand sanitizer, Patient Education Card and securement device. This tray has all the necessary components of a closed system tray (Foley catheter not included). Includes 10 ml inflation syringe. Available with 2000 ml drain bag or 400 ml urine meter attached to 2500 ml drain bag.